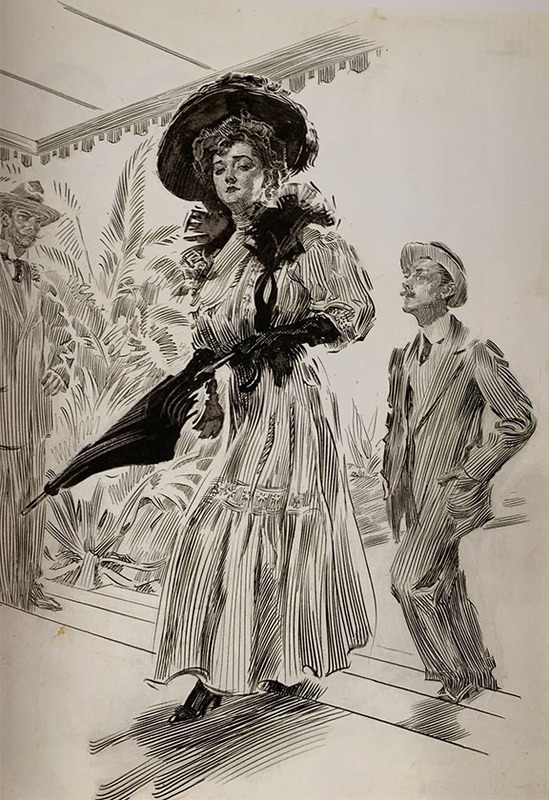 So, here is a James Montgomery Flagg illustration of a woman at the turn of the Twentieth Century who appears to be going inside with a big hat on. So, my question to my women's fashion expert, Jenny Smith, is, if Sharlot Hall was wearing this headgear to an appointment in an office, would she remove the hat, once inside? It seems like it would be quite complicated, or difficult, to put on and off. Yes? What was the protocol? She would have left it on. It was part of her "costume". Hat wouldn't have come off until she got home or when she was done with her errands and home. Wow! So what happened when all these costumed women went to a play, or had to sit in church in pews? That had to be a trainwreck in terms of viewing anything? Absolutely! You know the Easter bonnet song. Every woman showed off her hat at church and the theater. Most churches required women to have their heads covered. And, so the men are doffing their hats to be polite and the women are wearing these big flying saucers on their heads? That's just crazy, but I believe it. "In your Easter bonnet, with all the frills upon it, You'll be the grandest lady in the Easter parade. I'll be all in clover and when they look you over, I'll be the proudest fellow in the Easter parade." I'm 60, and I had to wear a hat or scarf as a kid while in the Episcopal or Catholic churches. And men took their hats off inside all buildings, including churches. In the era of the Gibson Girl above, she probably held her hat on with a couple of hatpins, 6-8 inches long. At that time, the hats were shallow, and perched on top of the head, so needed the pins to stay on.